Every day, thousands of potential customers are searching for your products and services online. Are they finding your website, or your competitor’s? Getting more customers using search engines, social media (Facebook & Twitter) and mobile phones doesn’t have to be confusing, difficult or cost a lot of money…but it is Extremely Effective! Did you know that 1 out of 3 of all online searches are for local products and services? That equates to over 2.6 BILLION searches performed online EVERY month for what you and your neighbors offer. What’s more impressive is, that number is growing by over 50% every year. With first page rankings consuming over 93% of consumer and business to business search engine traffic, what would that mean to your business if you could get your website in front of that much traffic? Smart, successful local business owners understand that in order to be successful, you have to invest in a marketing campaign. Unfortunately, the extent of most marketing plans consist of advertising in Yellow Pages, which almost no one uses any more, or blindly sending out 1000’s of postcard style mailings, hoping that their advertising dollars don’t get thrown in the garbage with the rest of the junk mail. We get your website in front of that traffic. At Breakthrough Digital Media, our methods are proven to spike your website to the top of the search engines. Our focus is in driving more targeted leads to your website, and converting those leads into customers for your business. Putting the power of Breakthrough Digital Media behind your site starts with a free consultation. 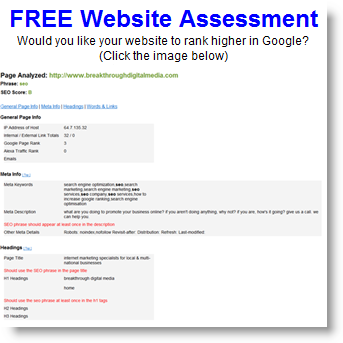 Call Now to speak to an SEO Consultant or request a Free Website Assessment.